If one ever gets to feeling (as I routinely do) that American animation is in a rut from which it will never emerge, or at least not until the back side of some terrible economic collapse, there's a simple enough solution: look to Europe. Some of the most interesting animated features of the last decade and a half have come from that continent (or the islands lying just northwest of it) - just in 2017, magnificent, unconventional European animated films that have made it to the United States include the living painting Loving Vincent, the brightly colored morbid clay children of My Life as a Zucchini, and, um Leap!. So, okay, so it's not airtight. Anyway, I share these musings on the occasion of my viewing of The Girl Without Hands, which is as European as it gets: not just made entirely on French dollars - mostly by just one French director/animator, Sébastien Laudenbach), impressively - but based on that most quintessentially northern European source material, the Grimm brothers' collection of fairy tales. This particular fairy tale is about a miller (Olivier Broche) who tires of his struggles in eking out a living, which makes him unusually vulnerable to an offer made by a hugely untrustworthy stranger (Philippe Laudenbach, Sébastien's father, and a longstanding workhorse of the French film industry): for the mere price of whatever is currently behind his mill, the miller can have infinite riches. Thinking this refers simply to his old apple tree, the miller agrees without a moment's hesitation; but unfortunately for him, his daughter (Anaïs Demoustier) was sitting in the apple tree at that very moment. Even more unfortunately, though very unsurprisingly to anybody who knows their Germanic folklore, the stranger is the Devil in disguise. Luckily for the young woman, she is so pure that the Devil can't even touch her. After a few false attempts to despoil her, he finally forces the miller to chop of her hands, hoping somehow that the blood will render her filthy. But her even purer tears keep her clean and safe, and ultimately the Devil just forces her into exile. Here she meets a kind prince (Jérémie Elkaïm), with whom she falls in love; this is only about half of the film gone, mind you, since the Devil is still out there, and he is right pissed about being deprived of his prize. 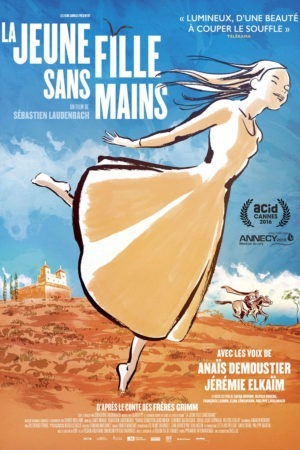 At all of 76 minutes long - an ideal length for an animated fairy tale, as Disney used to know - The Girl Without Hands doesn't bother messing around with subtlety or psychological realism; it is pure archetype, embracing the essentialist nature of fairy tales to a degree that I've only rarely ever seen in a motion picture. That has a lot to do with the incredible, maybe even one-of-a-kind aesthetic that it uses to bring the fairy tale to life; one which presents characters as simple collections of lines and flat fields of color, closer to pure abstractions than life studies. The style is, broadly speaking, evocative of Chinese ink wash painting: that very distinctive look of black ink drawings softly blurring at the edges as the ink bleeds into the paper. That gets us closer than any other comparison I could make, though not all the way. For one thing, The Girl Without Hands was painted digitally, which means that no matter how much effort Laudenbach put into fuzzing the edges of his strokes, they always have the pixel-perfect clarity of something made on a computer. For another thing, The Girl Without Hands uses strong colors. And the totality with which the film embraces abstraction goes beyond the traditions of any traditional Chinese painting I'm familiar with (which is not, to be sure, all that much). Sometimes, Laudenbach's representation of a space is relatively concrete; sometimes, it's just severe thick lines in the vague approximation of a tree or a building. And the characters are only rarely more clearly defined than a line drawing with just enough facial expressivity to be emotionally engaging. More often still, the characters are collections of disconnected curves that mostly evoke the human form, with irregularly-shaped patches of solid color forming behind them to suggest, in the very bluntest way, who the characters are. It's a form of representing humans as elemental and simple as the plot itself, which I hope comes off as praise, because I could hardly be more in love with any of this. Watching the approximations of human bodies that glide with watery smoothness across the screen, manifesting over slabs of primary colors, is as close to an exercise in direct emotional presentation as it gets: the film barely represents its plot at all, but mostly moment-by-moment impressions, feelings, physical sensations, and all such intangible things. Like any good fairy tale, it works on the guts more than the brain. And not only because of the primeval quality of its sketchy images! When he needs to, Laudenbach can create a more substantive image, as he sometimes does to depict the changing forms of the Devil, especially the grey and brown animals with bright red eyes who feel perfectly like something out of a childhood's restless dreams. Or, there's the matter of the film's landscapes: fields of color and shape that have the quality of impressionistic watercolor paintings, suggesting both the holy sacred flatness of the artist's canvas, as well as the endless width and breadth of the world beyond the forests and mountains and towns described by folklore. And I would hate myself for failing to mention Olivier Mellano's score, so sparse as to feel almost like a collection of pure notes, just melodic enough to give the film something concrete to anchor itself with. To put it basically: The Girl Without Hands is a great triumph because of its unparalleled ability to capture the essence of myth and legend, and to give it a beautiful form that's as easy to understand as a child's drawing while being so fluid and flexible as to be almost undefinable. Forgive the hyperbole, but I mean this sincerely: it is the kind of thing that cinema is uniquely capable of, and animation is uniquely capable of within cinema, giving movement and live to shapes and forms that evoke reality in the most stylised means. If I refrain from giving it that crucial last half-star, it's only because the film's strict adherence to the narrative logic and minimalism of folklore means that it's emotionally remote more than is entirely healthy for it (to compare it to the last animated film that made me this hot under the color, The Red Turtle - the two films premiered within a week of each other at the 2016 Cannes Film Festival - The Girl Without Hands never made me shudder with emotion and desire to weep, the way that film so ably did in its devastating final minutes). Still and all, this is the most I've loved a 2017 release, animated or otherwise, and I frankly can't imagine what could possibly change that.